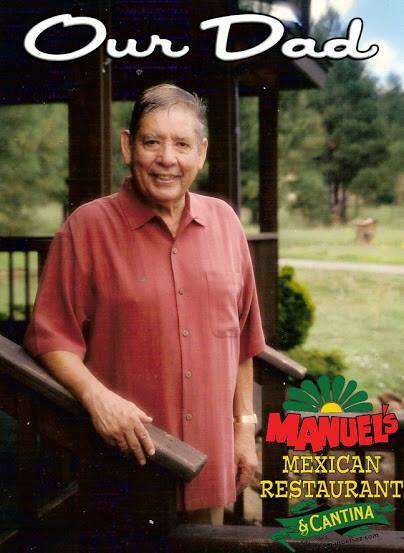 Manuel’s Mexican Food restaurants were established in 1964 at 32nd Street and Indian School Road by Manuel and Alice Salazar. Our desire to serve the community with a friendly atmosphere and to serve our guests with the finest in Mexican food still holds true today as much as it did the first day we opened our doors. As our family grew so did the amount of restaurants. Today, all of the restaurants are owned and operated individually yet collectively by all members of the Salazar family. Manuel’s has received numerous awards for our quality food and we maintain that quality by preparing our food from scratch daily, just as we did in 1964. We hope you have a pleasant experience with us and give us the opportunity to serve you again. On behalf of all of the family at Manuel's Mexican Food Restaurants, we would like to offer our warmest thanks to our staff members who have been with us for over 20 years. You are a source of pride and inspiration to us all. We would like to recognize how much energy you have put forth in your jobs. your dedication and hard work has been an integral part of our family. Thank you for your teamwork in making our company a great success. 1964 – Manuel and Alice Salazar opend the first Manuel’s at 32 Street and Indian School Rd. Grilled Steak, Chicken or Pork Carnitas, Grilled Green Chilies and White Onions, Spanish Rice, Refried Beans, Tortillas, Sour Cream, Guacamole, Green Tomatillo Salsa, Chips & Salsa. Choices of Assorted Miniatures (Chimichangas, Flautas or Taquitos), Espinaca Dip, Spicy Bean Dip, Jalapeno Cream Cheese Dip, 7 Layer Dip, Chips & Salsa. How did you hear about Manuel's Catering? By checking this box you agree to be added to Manuel's Mexican Restaurants email marketing database and agree to receive periodical emails regarding marketing and promotions. Manuel's promises to never sell, rent or misuse your personal information.